The White House Honors Veteran Entrepreneur "Champions of Change"
"VEO has envisioned becoming a national leader in helping our homeless veterans. And as we strategize and help change lives, we are developing future leaders and future champions of change. I believe that our military veterans are the cornerstone to national economic empowerment." There is a house waiting to become a home. Collective measures by individuals, neighbors, communities, corporations and unsung heroes, create the capacity to “stamp out” homelessness among our veterans. One by one working relentlessly, we as a nation possess the artistry to house each and every homeless veteran. I believe that we all are “Champions of Change” when we provide our veterans with the needed resources and coping mechanisms that empower their lives. Being nominated as a Champion of Change can be attributed to the men and women who were brave enough to seek help. They too are searching for change in their own lives. Some of our veterans have encountered unforeseen circumstances which led to temporary setbacks, but it does not tell the true story of their inner strength and thirst for stability. The heroism and courage that endures within our military soldiers and veterans is the very reason I volunteered to serve this population of heroes. I am honored by the recognition of being called a “White House Champion of Change” and I humbly revere this award alongside of many other champions that made this possible, my family, VEO staff, community partners, and most importantly, the veterans. I am proud for answering my call to duty, in acknowledging my passion to serve with a sense of urgency. VEO has pledged a commitment to run a race that requires identical traits of our veterans: duty, sacrifice, discipline, teamwork, mental toughness, nobility, proficiency, excellence, professionalism, and honor. I am proud to be an American, where at least I know I’m free. WASHINGTON, DC – On Wednesday, August 27, 2014 at 1:00 PM ET, the White House will honor "Champions of Change," veterans and their families who are doing extraordinary work across the country as leaders in entrepreneurship. The Champions have distinguished themselves by continuing to serve our country through their successful small businesses and non-profits that create jobs, spur economic growth, and help their communities. The Champions include veterans who have started a for-profit or non-profit business, veteran spouses who have started their own business, and individuals that support veteran entrepreneurs by providing them with skills, capital, and other necessary resources. This event will showcase these inspirational leaders and highlight the importance of their work. The program will feature remarks by Dr. Jill Biden and will also feature Daymond John, Kevin O’Leary, and Robert Herjavec, from ABC’s Emmy Award-winning TV show Shark Tank. 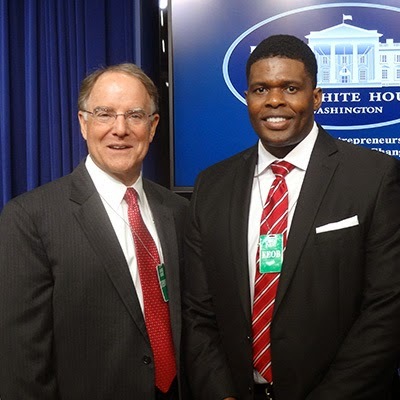 Mr. Frantz Fortune has been recognized by The White House as a "Champion of Change" for his continuous efforts in providing workforce and social enterprise programs that assist veterans in reintegrating back into our communities and moving them towards self-sufficiency. Understanding the impact a community and the businesses within that community can make, VEO's social enterprise program serves to employ, train and help veterans establish mutually beneficial relationships with our corporate and business community partners.